Last night I was in the mood to bake but can't think of what I want to do. Finally I settled for some swissroll. I didn't want to make the plain old one colour swissroll so I made them tri-colours. 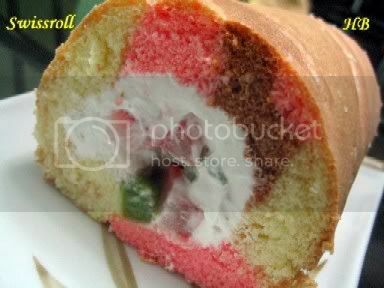 Tri-colours swissroll with strawberry and kiwi filling. Whisk (B) until soft peak, then add (B) to (A). Fold in sifted cake and corn flour. Mix well. Then add in melted butter to mix well. Pour mixture onto a lined baking tray. Bake in a pre-heated oven at 190 deg C for abt 15 to 25 mins. When cake is baked, leave it in baking tray for abt 5 mins. Turn cake out onto a piece of greased proof paper and immediately roll up the sponge cake together with the paper. Leave it rolled up to cool for abt 10 mins. After the sponge is cool, unroll it and spread a layer of whipped cream or jam onto the sponge cake and roll it up using paper as a guide (like rolling sushi). Leave sponge cake in fridge to chill before serving. Lee Lee, thanks for the swiss rolls! They were so yummy indeed, something different from the usual one! Siti, I will post the recipe up for you soon. Thank you so much leelee, i really appreciated yr kindness. Siti, I have posted the recipe for you already. Happy trying. Wah...this is so delicious and colourful!!! Kudus to you! hi! i saw the popcorn entry earlier on, i was wondering how do u caramelize the sugar? frozz, you need to put some sugar in a wok or pot, add a little water to cover the sugar. Let the sugar melt in the pot/wok. Do not stir it at all at this time. If there are sugar that are not covered with the water, swirl the wok/pan to melt it. When sugar has all melted and starting to turn brown (always use small fire), be careful of the caramel at this stage because it will burn easily. When sugar is all brown and nice, turn off fire and remove wok/pan from stove. At this point it is ok for you to stir your caramel. Lee, I made yr swissrolls today. It's so soft and yummy. Hi Lee, may i know what is the tray size for this roll. thank you for sharing yr wonderful recipes. May i know if i wanna make chocolate swissroll, how many gram of cocoa powder. How do i adjust the flour content. sl, no need to replace flour. Just add some melted chocolate into your mixture and you will get a nice chocolate swiss roll. Hi siti, I can't remember but I can check for you. I dont have any experience in baking nor cooking but hv interests in baking... can i know the recipe for the swissroll that you've posted on ur blog, how big a tray should i use? And what is ovalette? Lee, today I tried a swiss roll recipe that doesn't separate the egg white and yolk. But mine's not successful. My swiss roll didn't rise. Any idea what cld have gone wrong? What is meant by cream eggs and sugar till "light and fluffy"? Hi kwf, you have to make sure the eggs and sugar are beaten well. When it says cream sugar and eggs till light and fluffy it means that you have to beat until the mixture is very pale colour and the mixture is creamy and thick. LeeLee, thanks so much for this wonderful recipe, it was indeed very very soft. My dh likes it so much and it was finished almost immediately. Hi Kellie, you are most welcome. I used a 10" x 12" pan. I'd tried your swiss roll recipe yesterday. It was my first attempt and I finally made it. Anyway, I would like to know have I bake it too long (17 mins) cos I find it abit dry. I used 5 eggs cos my eggs are really small. And I would like to have your permission to post the recipe on my blog? Hi my@ddictions, 17 mins shouldn't be too long. If you find it too dry you can actually add 2 to 3 tbsp of milk into the mixture. Of course you can post the recipe if your blog. by the way, for all kinds of baking, be it cupcakes, cookies and swiss roll, what temperature should I pre-set? As previously mentioned, my cakes turn out nice brown on the outside but kinda moist on the inside and rather dry. Has it got to do with my pre-set temperature. Pls guide. Am desperate to get the pre-set temperature right. I am asking the same Q as Mummy to JJs, what is ovalette and can we omit it ? Thanks for such marvellous blog. I've been trying making swissroll and fails for so many times. I use different recipes, one time with baking powder, and some other time not. I saw ur recipe have the ovallette, yet i will try again. I do have some questions, what is the difference of beating the egg whites+sugar (stiff) and the one you mentioned for swissroll (mixture is very pale colour and the mixture is creamy and thick). There are many times I bake, the cake rised but it turns out to be dry and rough! Sad story. Separating egg yolk and egg white method is to get a softer texture cake. Add a bit of milk if you think it is too dry. Can I know why must the swiss roll be rolled after take out from oven b4 apply the cream? Hi Anne, actually it is to help it get the shape of the roll. But some swiss roll no need to do this step. You can just leave it to cool down and apply cream and then roll. The swiss roll also will not crack during rolling. Hi Anne, of course you can use this to make Christmas logcakes. I baked the swiss roll using your recipe. It was delicious! However, my hubby find it a bit dry. I just have to add some fresh milk in future rite? Ya, just add a bit more milk. Just divide the batter into three parts and add two different colours into the two parts. Pour one colour onto the baking pan and followed by the next colour pour it next to the first one and continue doing the same with the three part. I'm a big fan of your blog. I've tried the sponge cake and my family absolutely loves it. Recently, I've tried your swiss rolls as well (twtice), but it has been unsuccessful. My cakes crack into pieces whilst trying to roll. When you say "add (B) to (A)", does it mean using the folding method? or using the electric mixer to whisk it? I presume we fold in the flours and the melted butter? and when you preheat your oven, how long before do you preheat and at what temperature? Hi Kristy, yes you use the folding in method. Usually about 5 to 7 mins.